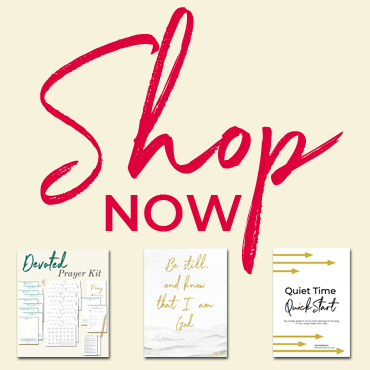 Have you ever wanted time to stop for a while so you could step back, breathe and get organized? Being a homemaker can be hard, exhausting and even frustrating. There’s so much to do – every minute of every day! 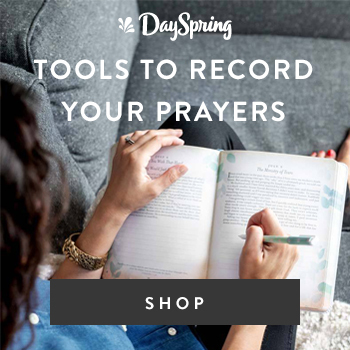 Meals to prepare, bills to pay, rooms to clean, laundry to wash – nevermind trying to find time to pray and study the Word, take a shower or put on some clothes that you wouldn’t be embarrassed to wear outside of the house! It can be so easy to end up feeling overwhelmed. But by addressing key areas of homemaking life, it’s possible to reduce the overwhelm and calm the chaos. Isn’t it true that when you take your eyes off the Lord, everything seems more chaotic and frustrating and hopeless? In order to maintain any kind of joy or peace in homemaking, God has to be your priority or you’ll always be overwhelmed. You must be a homemaker for Him, first and foremost. A nine-week Bible study focusing on living day-by-day in these aspects of Christian life: Love, Grace, Rest, Joy, Hope, Surrender, Prayer, Peace, Presence. It’s available on Amazon in Paperback and eBook. Do you seem to spend, spend, spend at the drop of a hat when it comes to consumables, groceries and home decor? If you stop and think, you’ll find creative ways to meet your family’s needs so you’re not always spending your hard-earned money (or spending money you don’t even have in the first place!). Find out how to freeze your spending and change your life with this book from Elite Blog Academy founder, Ruth Soukup. Do you ever (maybe even daily?!) experience the panic of never knowing what to make for dinner? It’s a pretty common homemaker’s woe! Freezer cooking and using a crockpot can both help substantially… you can even combine the two for a mega win! Find several core recipes in this book from Kelly McNelis and never be stuck wondering what you’re going to make for dinner again! It’s available on Amazon in eBook. One of the biggest mistakes you can make as a homemaker is lack of discipline. It’s so easy to get into a rut of the “I’ll do it later” mentality. The Proverbs 31 woman was diligently disciplined (see Proverbs 31:27), which most likely contributed to her productivity and praise (see Proverbs 31:30-31). Find out how to easily and systematically work your way towards being more disciplined in just three weeks with this amazing little book from Crystal Paine. Let’s talk about one of the biggest sources of stress in your home… your closet. Do you see lots of garments in there but still feel like you have nothing to wear? Do you keep buying pieces but have no idea how to pair them up? It can be so stressful! And a solution can seem so out of reach… After all – what busy homemaker has time to try out lots of different outfit combinations?! Help is at hand in the form of the Stay At Home Mom Wardrobe Builder from Get Your Pretty On! 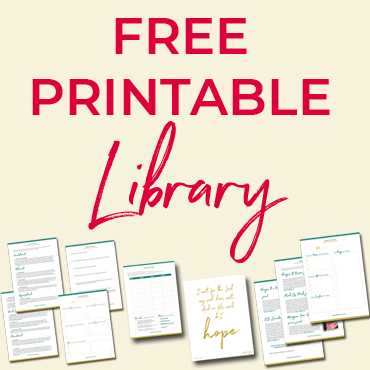 It’s a 20 piece capsule wardrobe program (with free printables) that gives you all you need to build a fashionable, functional wardrobe that works for your everyday mom life! You’ll never have to wonder what to wear again. Available on the Get Your Pretty On website. If you’re struggling to find the discipline, balance or knowledge to take charge of any of these key areas, I highly recommend you try these resources. If you need overall help to get your time management sorted out, Crystal Paine can show you how to Make Over Your Mornings and even how to Say Goodbye To Survival Mode. 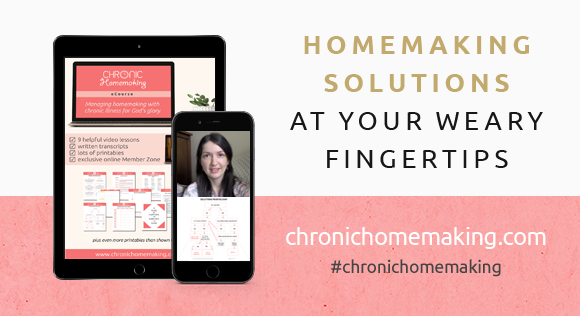 If you need help managing homemaking with chronic illness, you can find out more about my course, Chronic Homemaking. Being a homemaker is a beautiful way to serve God and show His love to others. If you’re struggling, don’t be afraid to invest in the help that you need. PRAY: That the Lord will help you to delight in homemaking as an expression of loving Him and serving Him. Ask Him to guide you in areas where you need help and to give you patience, strength, peace, and joy. These are well-known texts about women and their responsibilities and roles as a homemaker, but don’t allow the familiarity to keep you from really digging in and uncovering the gems of truth that God will reveal to you if you seek Him with your whole heart. REMEMBER: There are always solutions to any homemaking issues or problems that you’ll encounter on your journey. All you have to do is find them and (the part that most people miss:) put them into action. So… As a homemaker, which area of overwhelm are you going to tackle first? → Need some help getting your work/life balance sorted out? Click to read: Christian Blogger, Are You Making This Huge Mistake?